A big thanks to those who helped me figure this out here on the forum. I have LED bulbs in the front and lights on the back now. I have running and brake lights to boot. These were taken in the morning. Plenty bright and safe now. Please post the details of you light system. 12 or 6 volt please? Inquiring minds want to know. That is great! They are so much easier to see & much safer! Source for the front lights PLEASE! Also... 6 or 12 volt? My 11 touring has LED's all the way around as your t. I run mine off a small motorcycle battery underneath the rear seat. Works good so far, only pulls about 200ma when turned on. Mark. Looks good! What model year is Your truck. DO You have Low and High beams. Ya Mark, I think there are several of us waiting for your info if you'd be so kind. I know I'm waiting to hear about it! Ok sorry I was busy with other projects since this post. Bulbs in the headlights are from "Superbrightleds.com" Part number 1142-cw18-t. They are 2 pin and the pins on the sides are equal so they fit right into the T headlight socket just fine. I went with the cool white version. 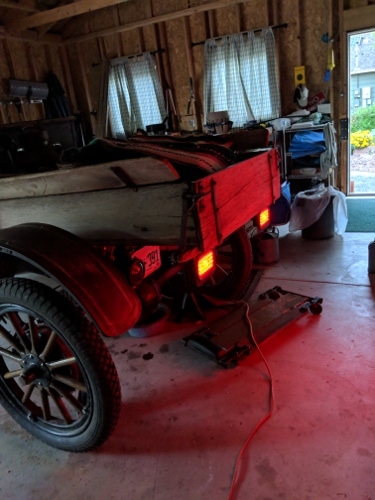 I used most of the model T wiring up front however I did run a wire from each headlamp socket to the frame for a ground. To the casual observer the same 2 wires go up into the sockets. The wire going from one to the other supplies the power. These go up to the switch on the column and back down to a power bus bar I installed under the seat. Power to the bus bar comes from a small motor cycle battery which is also well grounded. Power for the rear running lamps comes from a wire tied into the wire for the front lights so they all come on when the switch it turned on. ( I eliminated the low beam wire for now as well as the small unit attached to the firewall. I will wire that in later. I have a stop light switch which gets it power from the bus bar also and from there the wires go back to the LED's at the rear of the tuck. I plan to wire in the (FP) battery charge unit when I have the time, trying to get ready for an upcoming 5 day tour. Mark, are you running these on 6v? 12 Volt, makes a lot of light for sure. 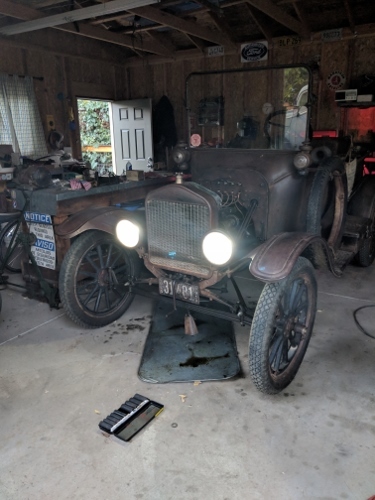 Jim, it is a 1918 roadster p/u. Did I answer all of the questions? My next post will be about top bows which I know some of you know a lot about. Again thank you for this forum and all of the help that is offered here. 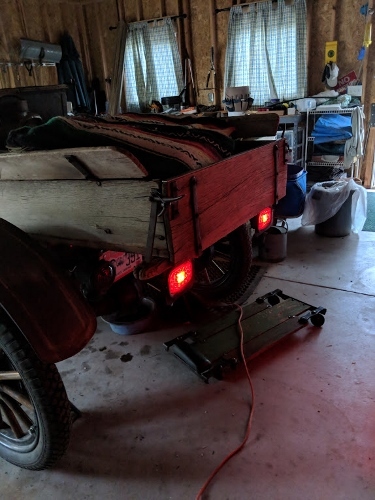 Oh Guys, I have forgot to mention that I have very good grounds a 3 points on the truck and the headlamp sockets are new, makes life easier when doing things like this. I used the same LEDs when I did a complete rewiring job on my racer in 2010. 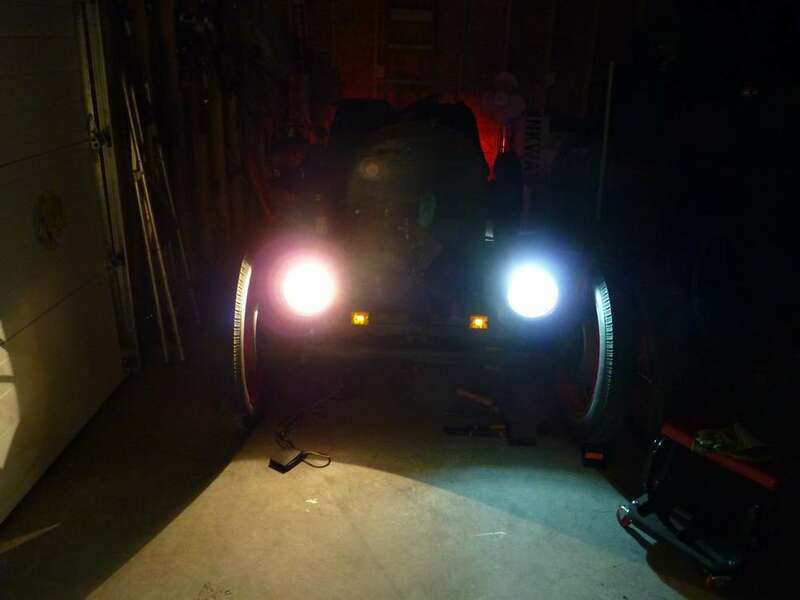 I found them usable as DRL's but NOT good enough to be out driving at night with - not fast anyways. I just wanted my low profile racer to be more visible on the streets or highway in the daytime. You can see the difference in beams on the floor. Left side of photo is incandescent and has a stronger light and better defined shadow on floor. The right side is LED. It may look brighter looking into the light, but you can see the difference on the floor. Again, these are perfect as DRL's. Interesting, I will have to try it at night. Maybe I should have gone with the warm color instead. Were yours running off the mag or battery? Also my headlamp buckets have the new chrome reflectors inside which seemed to help a lot. My reflectors are NOS inside large drum headlights - got lucky on eBay many years ago. The racer is all 12v - no magneto. Don't forget your three oil lamps. I lit mine this morning as DRL's. Simple to use and it is surprising how the other drivers notice them. Well, I'm doing it again,....it's late, and I'm tired, but accordingly, I guess I'll have to show my ignorance and ask,....what the heck are "DRL's"? It's hard for us old guys to keep up with all the abbreviations being used in all of the different communication methods. Ok as requested, I finally had a chance to check the lights out in the dark tonight. Not too bad at all. I will check on the road at night next chance I get but I like what I see, (12 volts). Hip, Hip, Hurray for Harold :-) I guess we are the "baby boomer generation" where we still use whole words. Much easier understanding for us ol' farts !!! A 6 to 12V convertor is a cheap easy to wire solution. They cost about $35 and are available from either eBay or Amazon. Mine is about 3" square, and about an inch deep. I mounted on the wood behind the firewall, under the floorboard. It has 4 wires 6V in hot and ground, and 12V out hot and ground. The grounds can be wired together. 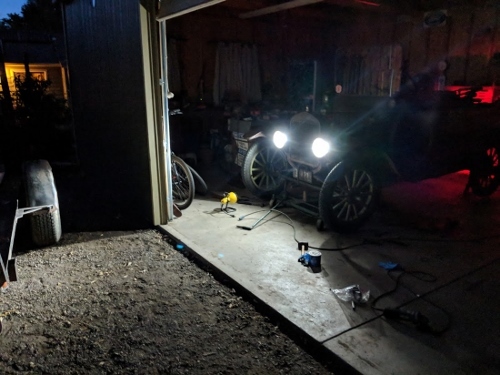 I got my 6 volt LED headlight bulbs from a fellow in Australia trading as Classic and Vintage Bulbs. 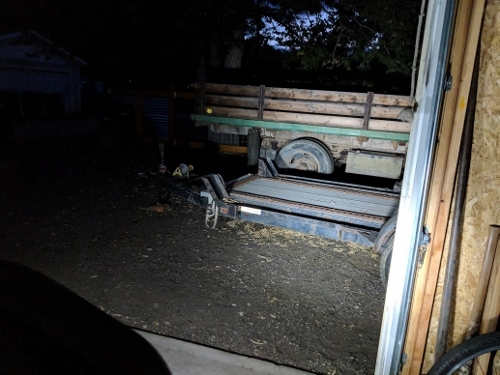 The shipping made it rather costly, but they are working excellent, and I drive a lot at night. It is necessary to order them "earth specific". The negative ground versions are in my T and I have positive ground ones in my Model A and the Chandler. He is going to be at Hershey at C4R 12. I definitely plan to stop and get a few more for my other T's. I think they are around $30 each. What about the motorcycle size halo angle eye LEDS put in the cowl lamps? That way you can have the best of both worlds.